Former General Motors Vice Chairman Bob Lutz went bicep-to-bicep with "America's ballsiest pundit," Stephen Colbert, last night – and came out ahead. Ostensibly, Lutz was on Colbert to talk about his new book, Car Guys Vs. Bean Counters, but as one might expect, the discussion veered into Mitt Romney vs. President Obama territory pretty quickly. The actual car industry part of the discussion, though, revealed more potential good news for the Chevrolet Volt, the car that Lutz is obviously trying to make his legacy and called "a huge success." Sure, Colbert talked about what his friends over at Fox News have been saying, but Lutz responded by predicting that sales would be "about 3,000 a month from here on out." 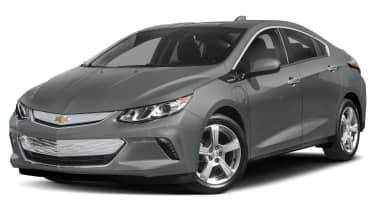 This would not only set a new record (Volt sales for March 2012 were 2,289, the highest so far) but would also put GM's plug-in car into the 36,000-a-year range. That's commendable, but still not where GM CEO Dan Akerson said last December things would be this year. Of course, Akerson's 60,000 number could have included the Opel Ampera and its Vauxhall twin. In any case, things are looking up for the Volt, and that's something Lutz is more than happy to tell Colbert or anyone else. Watch the video – including an impromptu push-up contest between the two – right now by scrolling below.